After this week's diplomatic reception, you probably saw lots of press noting that the Duchess of Cambridge wore the Cambridge Lover's Knot Tiara at the event. Except ... she didn't! The Cambridge Lover's Knot Tiara is a totally separate piece from the sparkler that Kate wore on Thursday. 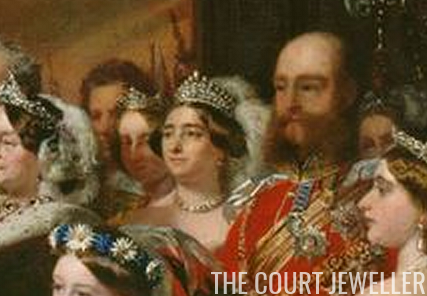 Gather 'round, magpies, and let me tell you the story of the real Cambridge Lover's Knot Tiara. The year is 1818, and the unmarried sons of King George III of the United Kingdom are scrambling to find royal wives and produce royal heirs. George's seventh son, the Duke of Cambridge, chooses a German bride: Princess Augusta of Hesse-Kassel. Among her wedding gifts is a diamond and pearl tiara with lover's knot motifs. 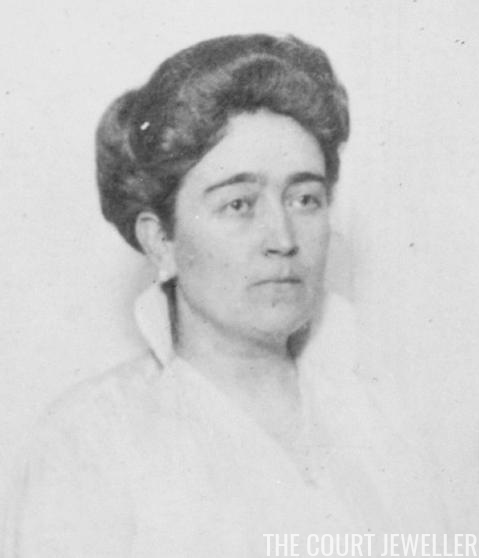 The tiara was reportedly a present from Augusta's family. Above, the Duchess of Cambridge wears the tiara in an illustration published in La Belle Assemblée, a British women's magazine, in 1830. 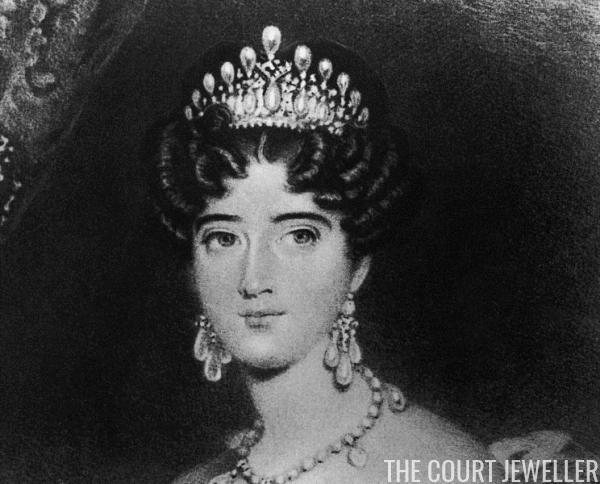 Although Augusta had other tiaras, she wore the Cambridge Lover's Knot Tiara for some of the most important royal events of her lifetime, including the 1838 coronation of her niece, Queen Victoria. In 1843, however, she passed the tiara along to the next generation. 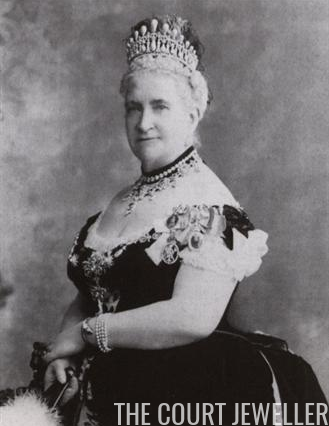 It was her wedding present to her elder daughter, Princess Augusta, who married Hereditary Grand Duke Friedrich Wilhelm of Mecklenburg-Strelitz. The younger Augusta is depicted wearing the tiara in the painting above, which documents the 1858 wedding of the Princess Royal. Montenegro's monarchy was officially abolished in 1918, when the country was merged with Serbia to form Yugoslavia. Jutta spent the rest of her life in exile. 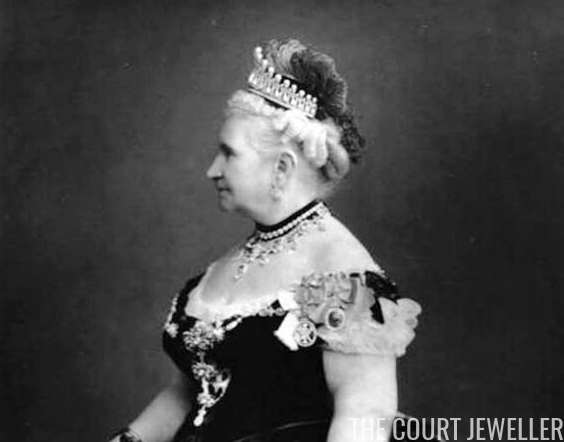 Precisely what she did with her Lover's Knot Tiara is unclear; she had no children to inherit the piece, and some think she may have privately sold it during her lifetime. She died in 1946, and the tiara popped up next in public in May 1981, when it was sold at Christie's in Geneva.